Attacks by the White Shark, Carcharodon carcharias, on humans off the Pacific Coast have been well publicized since the release of the movie 'JAWS' over a quarter of a century ago. What have not been publicized are their attacks on inanimate objects. These objects have included, but are probably not limited to; boats, crab trap buoys, otter boards of commercial salmon fishermen, a crab trap and a zodiac. The fact that an adult White Shark would strike out at, or bite, any of these objects raises some questions as to the motivation for their attacks on humans. Among the most noteworthy of shark attacks on manmade objects are those on boats. Although not the only species involved in these attacks, the most frequent culprit is the White Shark. White Shark attacks on boats have been reported from numerous places, including Australia, Japan, South Africa, Canada, South America and the United States. Attacks on boats and other types of marine vessels were recorded as far back as 1865 in V.M. Coppleson's book "Shark Attack." 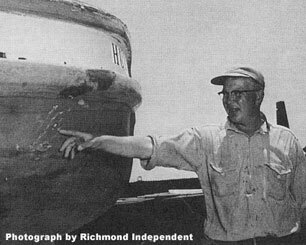 One of the more intriguing cases of a White Shark attack on a boat occurred on 9 July 1953 off Fourchu, on the southeastern coast of Cape Breton Island, Nova Scotia, Canada. Commercial fisherman John D. Burns, with companion John MacLeod, set out daily in his dory to harvest lobsters. Many dories dotted the sea in their quest of the prized crustacean, but only Burns' had a white-painted hull. For nearly a week the white-hulled dory was followed by a large shark after leaving the harbor. Day after day the other fishermen watched in disbelief as the shark stalked Burns and MacLeod's dory from behind, just as an African Lion (Panthera leo) on the savanna might stalk a Thomson's Gazelle (Gazella thomsoni). No sooner would their dory put out to sea than a large dorsal fin would appear astern of the boat. Then, as the dory sailed alone on July 9, the shark charged, smashing a 20-centimeter hole through the bottom of the boat. Burns and MacLeod were thrown violently into the sea. Tragically, Burns was unable to combat the heavy seas and drowned. MacLeod, however, was rescued hours later, clinging cold and forlorn to the hull of Burns' damaged dory. The shark did not return after its initial - and only - strike against the boat. After the boat was retrieved, an incriminating tooth fragment was removed from the hole in the dory's hull. Ichthyologist William C. Schroeder, of the Museum of Comparative Zoology at Harvard University, identified this tooth fragment as having been lost by "a White Shark about 12 feet [approximately 4 meters] in length and weighing 1,100 to 1,200 pounds [500 to 550 kilograms]." 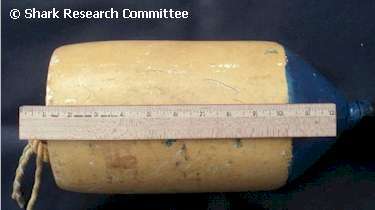 Two separate cases of White Shark attacks on crab-trap buoys were described briefly in the January 1983 monthly report of the California Department of Fish & Game. These attacks occurred off Low Gap, near Usal (40�06.0' N; 124�01.0' W), and Jackass Creek (39�53.0' N; 123�56.0' W) near Shelter Cove, between Fort Bragg and Eureka, in northwestern California. The Department of Fish & Game report said, "Two crab fishermen brought in three crab trap buoys that were hit by White Sharks. One buoy was off Low Gap, about 3 kilometers south of Usal, and two were from Jackass Creek: all in about 9 fathoms of water. Two whole teeth were removed from one buoy and measured 42.0 millimeters and 42.2 millimeters in height. The other two buoys had serrated tooth patterns. All buoys were X-rayed, but no additional teeth or fragments were found." On 28 August 1989, at 1430 hours, Gerald Moser was trolling for salmon in 10 fathoms of water near the Port Orford whistle buoy at Port Orford, in far southwestern Oregon (42�44.0' N; 124�30.0' W). The ocean conditions were moderate, with whitecaps present on the surface from a steady northwest wind. The Tequila, a 7-meter fishing boat, was approached from the stern by a 3- to 4-meter White Shark. The shark struck the trawler's fishing gear, which was partly submerged, biting in half a white inflatable float bag measuring 61 by 36 centimeters, then seizing and biting several times one of two wooden otter boards measuring 61 by 36 centimeters. The shark submerged after mouthing this equipment and was not seen again. The following two cases are noteworthy in their similarities and the fact that they occurred almost 30 years apart. The first incident was reported by ichthyologist W.I. 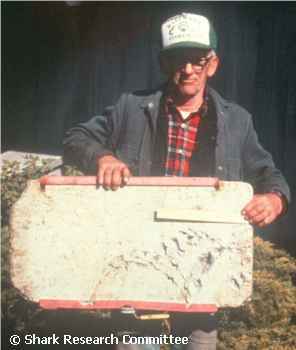 Follett in his 1974 publication "Attacks by the White Shark, Carcharodon carcharias (Linnaeus), in Northern California." On an unspecified data between 10 and 12 September 1959 at about 1530 to 1600 hours, a White Shark attacked Henry Tervo's 12-meter fishing boat Hunter between False Klamath and the Klamath River, near Crescent City in far northwestern California (about 41�34.0. N;124�16.0. W). Tervo was piloting his boat about 6.5 kilometers offshore in 30 to 35 fathoms of water. The sea surface was whipped into whitecaps and the water was turbid. Tervo recalled, "I thought I'd hooked a shaker [undersized salmon (Oncorhynchus sp.) ] on my port trolling line and reached down to pull in and release the fish. I saw something coming at me like a torpedo, then recognized a White Shark about 15 feet in length. It struck the stern and its impetus raised its body and tail out of the water to [such] a height that I thought it would topple into my boat. After it released its hold it swam under the stern and surfaced on the starboard side of my boat. I ran and got my gun and when I looked out it turned toward the boat, then submerged out of sight." A tooth fragment was removed from the stern of the boat. The fragment compares well in size with teeth from a 3.5-meter White Shark. The second incident occurred on 9 April 1989, at Monterey Bay, California (36�37.0' N; 121�56.0' W). At 1035 hours, Jon Capella and friends were aboard the Xeno, a 10.7-meter boat with a white and blue hull, about 1.5 kilometers south of the whistle buoy at Point Pinos. The water depth was 10 fathoms. 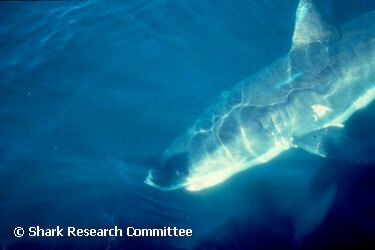 They observed a 5-to-7-meter White Shark feeding on a Harbor Seal (Phoca vitulina) . After 10 minutes, the shark began to circle the boat, finally ramming the bow with its head. The shark struck the boat's hull four times over a 15-to-20-­minute period. Just prior to its departure, while astern of the boat, the shark rolled to one side and began slapping the swim step and propeller with its tail. The boat had drifted some 20 to 30 meters from the seal at this time, whereupon the shark returned to the seal for several additional bites before it departed.